Coming Home Your Way offers college and university students returning from an education-abroad experience a wealth of pertinent information, opportunities for meaningful reflection, and practical guidance on making the most of their time abroad. Grounded in research and addressing an array of aspects of education abroad – including intercultural communication, changing relationships, and career impact – Coming Home Your Way will be an invaluable tool for any student planning, experiencing, or returning from a stay abroad. Drawing from theory and research from multiple disciplines, and real-world experiences of students who have studied abroad, the volume addresses key themes critical to understanding reentry, including individual differences in taking in experience, communication patterns and approaches, the reentry transition, the nature of relationships in reentry, bridging reentry and career, and more. Within each chapter are opportunities for self-reflection that allow readers to integrate the ideas presented into their own experience. Compelling short fictional accounts add flavor and detail that bring theory to life. 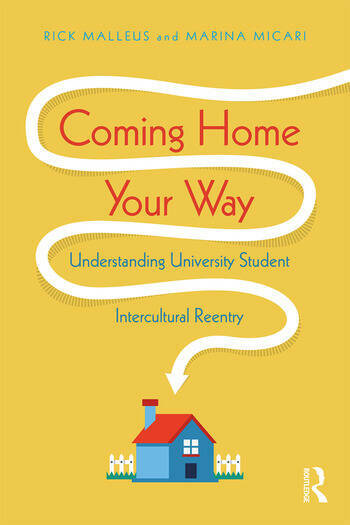 Coming Home Your Way provides a window into the complex experience of intercultural reentry. Reentry from an education-abroad experience can be a period of intense growth, and can feel disruptive and confusing while it’s happening. The authors explain and explore these complexities in a conversational style that will engage students, and with the rigor expected by their instructors. Like no other book currently on the market, Coming Home Your Way will give college and university students insight into the challenges and intercultural opportunities that reentry offers. 8. What’s new with you? Rick Malleus is a teacher and scholar whose work focuses on intercultural reentry. He holds a PhD specializing in intercultural communication, has published in the US and Zimbabwe, and presented his work at regional and national conferences. He was an international student in the US. Marina Micari has worked in higher education administration for fifteen years, and has published widely on student learning at the university level. She holds a master’s degree in intercultural communication and a PhD in education. She studied in France as a college student.